My head is bursting with thoughts this morning, none of which would make a post. So, it’s time for a list. 1. I’ve been obsessed with the story of Jaycee Dugard. OH. My. Gosh. I can’t even imagine the grief of her parents, knowing that girl has been imprisoned in someone’s backyard for 18 years. And then to think of HER two daughters who are going to one day realize they have been completely deprived of their lives. That story certainly gives me a whole new perspective when I am tempted to whine about the weather or having nothing “fun” to do. 2. I got a new kitchen appliance. 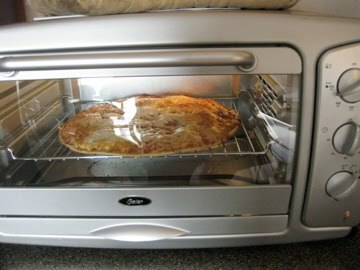 I have never in my life had a toaster oven. Aren’t you supposed to get one of those when you are single and just out of college? I am loving it! Now I can cook a frozen pizza or chicken nuggets without heating up the whole kitchen. And it makes great toast! It’s also a convection oven, so I guess I could cook a whole chicken if I wanted to. Now, if I only wanted to, I would be ready. 4. My 4-year-old niece stayed with us the past two days. She is a riot. The kids play so well together just having that one extra person in the mix. I got to experience what it was like toting around four kids, instead of three. My niece has some unique food preferences. She loves foods with a little zing, like salami, salsa and tomatoes. I asked her if she would like a pear, and she wasn’t sure at first. But then she dipped it in some ketchup and thought it was perfect. All three of my kids love her, but my oldest son has a special “big brother” relationship with her. 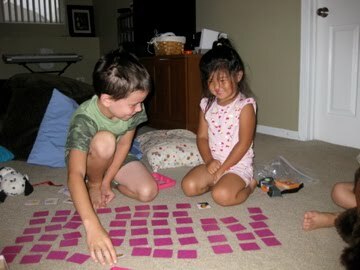 Here they are at 6 a.m. yesterday, playing Princess Memory. 5. And that reminds me. It’s my goal to start getting myself ready to start the day by 8 a.m. so I will be ready to begin home school on Monday. It’s 8:41, and I am just getting out of bed. Maybe school should start at 10? So, tell me about some of the random thoughts in your head this morning. What’s on your mind? Laurel, Have your kids gone back to school yet? "broiled cheese buns"?… I love it! Is that Canadian for "grilled cheese"? School should start whenever YOU say so! We call those toasted cheesers (cheese on a bun or bread broiled open face) and its a favorite school day breakfast with a bowl of home canned peaches on the side. Of course at this time of the year you could have a bowl of fresh peaches with cream and sugar on the side. MMM, mmmm, mmmm.My random thoughts are that I need to get back to blogging. It is such a nice break to the day and an exercise in writing which always makes me happy. I just think it is funny that when I hit "post" in the morning you will think I am copying you. I just read your post now and I have had a word document going where I am just writing down random thoughts and was going to post it in the morning.